Donald Trump gained even more in the polls in the days leading up to Super Tuesday while Marco Rubio’s support collapsed. Trump expanded his lead to 44% whereas Rubio dropped five points to 14% while Cruz now holds second place at 15%, according to a Morning Consult national survey of over 2,000 registered voters. “If Rubio hoped that going negative on Trump in the most recent GOP debate and on the campaign stump would reap benefits with voters, it hasn’t resonated with our national respondents,” the poll service concluded. In other words, every time Rubio attacks Trump, Trump’s lead grows, and similarly Fox News lost 50% of its support from Republicans by attacking Trump. Sen. Jeff Sessions of Alabama endorsed Republican presidential frontrunner Donald Trump’s campaign on Sunday. Trump announced the endorsement alongside Sessions at a massive campaign rally in Madison, Alabama. Sessions, known for his hard-line stance against illegal immigration, is popular in some conservative circles. The Economist, a publication that has come to be regarded as a megaphone for elitist sentiment, has published a leading editorial piece that argues Donald Trump “must be stopped” from winning the presidency. Entitled Time to Fire Trump, the editorial worries that Hillary Clinton may lose her slight lead over Trump in national polling if the U.S. economy falls back into recession, handing Trump the Oval Office. “He is so unpredictable that the thought of him anywhere near high office is terrifying. He must be stopped,” states the editorial. The article goes on to claim that Marco Rubio is still the establishment’s best hope of eclipsing Trump and that Ted Cruz should “get out of his way”. The Economist, which is 50% owned by the Rothschild banking family of England and is regularly represented at the influential and elitist Bilderberg confab, previously acknowledged that a global superclass does conspire to shape the future of the world. The editorial’s panicked tone again illustrates how not just the Republican establishment, but the neo-liberal global elite is absolutely petrified at the prospect of a Trump presidency. As we previously highlighted, during last month’s Davos summit, financial elitists expressed their alarm at the prospect of Trump being the Republican nominee, with highly influential CEO Martin Sorrell insisting that “Hillary will win,” a statement that some took as a threat rather than a prediction. Regular Bilderberg attendee and associate editor of the Financial Times Martin Wolf also asserted last month that the “global super elite” must stop Donald Trump from winning the presidency. A Koch-funded senator wants Republicans to support a “third option” against Trump, confirming GOP strategist Roger Stone’s revelation that the Koch Bros. want Mitt Romney to enter the race if Marco Rubio fails. “I sincerely hope we select one of the other GOP candidates, but if Donald Trump ends up as the GOP nominee, conservatives will need to find a third option,” Sen. Ben Sasse (R-NE) said, who’s 2014 senatorial campaign was bankrolled by the Koch Bros. This so-called ‘third option’ pushed by Sasse was actually conceptualized by the Koch Bros. during a meeting with the Rubio campaign Thursday in which they pledged support for Rubio – and for Romney to enter the race if Rubio implodes. Sasse previously attacked Trump during a speech to 500 establishment donors attending a Koch Bros. network meeting in Jan.
Is Mitt Romney about to enter the race for the Republican nomination? As I have written about repeatedly, the Republican establishment is absolutely desperate to keep Donald Trump out of the White House. If it comes to it, they will move heaven and earth to make sure that he is defeated – even if that means Hillary Clinton wins the election. Right now, Trump has won three of the first four contests on the schedule, and he is projected to win almost every state on Super Tuesday. This would put him on a clear path toward winning the nomination, and so establishment insiders are in full-blown panic mode. At this point, two different plans are being put forward for how to proceed if Trump continues to roll. One is to have Marco Rubio exit the race so that Mitt Romney can run against Trump, and the other is to run a third party candidate against Trump and Clinton in the fall. Even if Romney could not accumulate more delegates than Trump, that would be okay. The goal would be to just keep Trump from getting the number of delegates that he needs to secure the nomination. That would lead to a “brokered convention”, and as long as Trump does not win on the first ballot Romney would be the nominee. For much more on how this would all play out, please see my previous article entitled “How The Republican Establishment Can Keep Donald Trump From Getting The Nomination“. A memo prepared for the group zeroes in on ballot access as a looming obstacle for any independent candidate, along with actually identifying a viable, widely known contender and coalescing financial support for that person. The two states with the earliest deadlines for independent candidates, Texas and North Carolina, also have some of the highest hurdles for independents to get on the ballot, according to the research.“All this research has to happen before March 16, when inevitably Trump is the nominee, so that we have a plan in place,” a source familiar with the discussions said. The former director of the Central Intelligence Agency and the National Security Agency said Friday that if the military would have to disobey Donald Trump if he followed through on certain campaign promises as president. Trump frequently refers to his defense of waterboarding in campaign speeches. “I would bring back waterboarding and I’d bring back a hell of a lot worse than waterboarding,” Trump said at a GOP debate. He has accused his competitors with being too “politically correct” on the issue of interrogation techniques. Sheriff Joe Arpaio responded today to Vicente Fox’s profanity laced interviews this past week on a “f*cking” border wall. Fox is appalled that a presidential candidate would so openly speak out against illegal immigration. Today Maricopa County Sheriff Joe Arpaio responded to Fox’s profanity. A bill introduced in the state House would require the reporting of non-vaccinated students to the Colorado Department of Health and Environment. Currently those records are kept with the school. “What this bill is not about is requiring more students to get vaccinations. It’s about who will keep charge of the records,” said Rep. Dan Pabon, a Democrat representing Denver. A hearing at the state Capitol on Thursday was packed with parents who oppose the bill. Christine Carter has four children and has had them vaccinated. While privacy-invading measures imposed by the United States’ National Security Agency have been at the forefront of news coverage, Germany’s new “open” approach to secretly spreading malware has also attracted scrutiny among privacy advocates. “But we don’t know whether this program can intercept saved data, photographs we never share and make for ourselves, personal diaries, things that should be as secure as if they were stored at home,” Schleswig-Holstein regional lawmaker Patrick Breyer told Sputnik. Breyer is a member of the Pirate Party, which he said believes that the government should stay out of people’s computers and smartphones. The government should work to fix security vulnerabilities instead of intruding in the lives of citizens. The decision to compromise people’s computers without their knowledge was political, according to Breyer, rather than a move by the country’s court.A 2008 German top court judgment said that hacking computers is allowed in case of life-threatening danger or suspicion of crimes against the German state, such as terrorism. “The Constitutional Court did not say that the government should infiltrate operating systems. It simply defined the boundaries. Whether we want to do this at all is a completely political decision,” Breyer told Sputnik. The decisive factor, however, is whether the new virus conforms to the Constitutional Court’s allowance for the use of spying technology, Breyer says. While the German government said that the program can track keystrokes, phone calls, communications and record audio and video from the device. However, an earlier version of the virus released in 2011 also had the ability to receive third-party updates which allowed it virtually unlimited spying abilities. A hacker and computer security conference called the Chaos Computer Club found many of the vulnerabilities. This included the Trojan’s ability to be compromised and receive updates from third parties outside the government. “In the case of the so-called Bavarian Trojan, Chaos Computer Club examined it and found that it is capable of doing much more than is legally allowed. For example, it had the ability to download another code and program in completely different functions,” Breyer told Sputnik. The major issue is privacy, says Breyer, as people would lose control of personal data, which the German government itself has promised to protect.”Right now it’s like this: if an apartment is being searched, [the government] can’t conceal that. But if the spyware was installed, it’s completely unnoticeable. You may notice it, but only years later, and this is too deep of a meddling in our personal and often even intimate life,” Breyer told Sputnik. While the new virus has already been in Germany’s court, as privacy advocates say that it should be examined by the German government’s data privacy commisioner for its abilities and potential vulnerabilities. Germany’s Federal Criminal Police has so far refused to disclose the virus source code to the privacy commissioner. A plan prepared by the United Nations Security Council and backed by the United States and Russia to declare a ceasefire in Syria will be ignored by al-Nusra and other al-Qaeda aligned groups. The High Negotiations Committee (HNC) said Free Syrian Army (FSA) factions signed up to a temporary “cessation of hostilities” that begins at midnight Friday. The FSA is largely ineffective. It has been decimated by desertions and fighters going over to jihadist groups. In parts of the country FSA factions fight alongside al-Nusra and the jihadists. Al-Nusra told its fighters to ignore the peace deal and intensify attacks against the SAA, the Syrian Arab Army. In other words, al-Nusra, the Islamic State, Ahrar al-Sham, Jund al-Aqsa and other groups will exploit the ceasefire to regain territory lost to the Syrian government with Russian support in recent weeks. Saudi Arabia and Turkey actively support al-Nusra and associated groups under the command structure of Jaish al-Fatah. Turkish officials have admitted they provide logistical and intelligence support to the umbrella group. Turkey is also linked to Ahrar al-Sham. Saudi Arabia provides arms and money which Turkey moves across the Syria-Turkey border. Earlier this week Secretary of State John Kerry said if the ceasefire fails the United States will push to balkanize Syria. “It may be too late to keep it as a whole Syria if we wait much longer,” he told the US Senate foreign relations committee. A Palestinian has brutally attacked an Israeli security guard in a shopping mall with something that resembled an ax, a CCTV video shows. The assailant, who was a mall employee, is seen striking the father of four multiple times near an elevator. The incident took place in Maale Adumim, an Israeli settlement in the West Bank, 7km from Jerusalem. The suspect, later identified as 21-year-old Abu Hammad, approached the guard, Tzvika Cohen, and reportedly asked him to open the elevator door. Cohen wasn’t suspecting the attack as he knew Hammad and the pair worked together at the mall, Channel 2 reported. Hammad attacked the guard without warning, striking him several times with a metal object that resembles an ax, as seen in security camera footage which is circulating online. The guard is currently in serious condition at the Hadassah-University Medical Center on Mount Scopus, northern Jerusalem. Two days after the incident the Shin Bet (Israel Security Agency), police and Israel Defense Forces (IDF) managed to find Hammad, who is a resident of the Palestinian village of Eizariya, located near Maale Adumim. Hammad confirmed that he “implicated himself into a terrorist attack,” the Shin Bet said, as reported by the Jerusalem Post. Following the attack, the Israeli government moved to ban all Palestinians from Maale Adumim until Thursday, a spokesman for the settlement said, as cited by AFP. He added that about 500 Palestinian laborers are affected by the ban. A new wave of violence between long-standing opponents Israel and Palestine erupted in October when Israel attempted to restrict access of Palestinian men to the Al-Aqsa Mosque in the Old City area of Jerusalem. Since then, Israeli security forces have killed at least 168 Palestinians, 111 of whom allegedly initiated attacks. Palestinian assailants have killed 28 Israelis, as well as one US citizen. 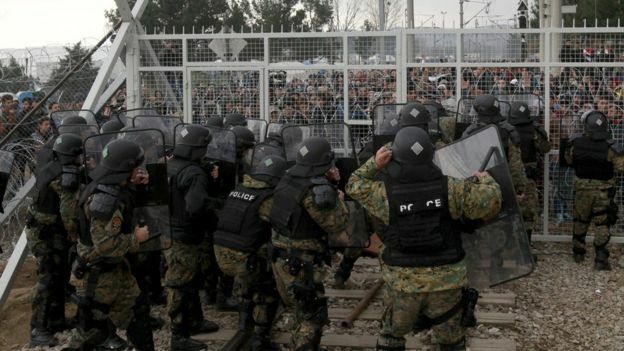 A crowd of migrants has burst through a barbed-wire fence on the Macedonia-Greece border using a steel pole as a battering ram. TV footage showed migrants pushing against the fence at Idomeni, ripping away barbed wire, as Macedonian police let off tear gas to force them away. A section of fence was smashed open with the battering ram. It is not clear how many migrants got through. Many of those trying to reach northern Europe are Syrian and Iraqi refugees. Tony Blair is accused of ‘presiding over a silent conspiracy’ that allowed two million migrants to enter Britain during his decade in power. A new biography of the former prime minister by the celebrated investigative journalist Tom Bower claims Mr Blair ordered his Labour government not to publicly discuss the issue. The book Broken Vows: Tony Blair – the Tragedy of Power alleges that the minister in charge of border control ruled against deporting failed asylum seekers because it would be too “emotional” to do so. Hours into a ceasefire brokered by Russia and the US, an Isis car bomb killed at least two people in Syria, and rebels claim government forces dropped barrel bombs near Damascus. Isis militants claimed responsibility for the car bomb attack on the government-held town of Salamiyeh in an online statement. The group said in an online statement that one of its fighters had driven a car loaded with explosives to a Syrian army gathering in the area and blown himself up among them, killing 20 people and wounding 35 others. Near Damascus, the rebel group Jaish al-Islam said government forces dropped two barrel bombs and opened fire on its positions during several violations of a cessation of hostilities agreement in the Eastern Ghouta. Citing field reports from the group’s commanders, Jaish al-Islam spokesman Islam Alloush told Reuters that in one incident government forces trying to advance “were dealt with with machine guns”. There’s one hurdle to using negative interest rates to get people to stop saving and start spending – cash. If interest rates on retail deposits went negative and people were charged for keeping money in a bank, there would be nothing to stop them taking it all out in cash and hiding it under their bed. This would scupper a central bank’s plans to stimulate the economy with negative rates, and has prompted a debate over whether or not to ban cash, or at least create incentives to ditch it in favour of a digital-only economy. It’s already going that way in Sweden, which has such low rates that people are hiding their cash in microwaves. The beginning of 2016 revealed what some have known for quite some time – financial markets are an epic disaster just waiting to be realized. A total of $16.5 trillion dollars had been wiped out from stock markets around the world… that doesn’t even count bonds and other things. So we have seen this massive amount of wealth wiped out globally… almost as much as the U.S. national debt. Of course, the past few days we’ve seen a bounce back… markets never go down in a straight line… If you go back to 2008, the two best days in terms of a point increase in U.S. stock market history were right in the middle of the Crash of 2008… just because stocks go up for a day or two does not mean the crisis is over. In my perspective we’re still in the early chapters… all of the red flags are still screaming that a lot more is to come… the entire global economy is imploding. As the collapse takes hold we can expect unprecedented maneuvers from our monetary masters. With central banks preparing to introduce negative interest rates, for example, savers and bank account holders will actually be paying for the privilege of keeping their money in the bank. The likely response, as we witnessed with a run on personal safes in Japan, is that people will simply take their money out of the bank and hold it in cash. We can only speculate that control of such a digital currency system will necessitate the implementation of ‘beast technology’ that may include forced embedding of tracking chips into the general populace. That may sounds conspiratorially crazy, but so too did the notion that physical cash will be banned around the globe… until a few weeks ago. But never mind that global trade has collapsed or the widespread job losses, because the average person on the street really won’t believe it until the stock market tells them something’s wrong. That day is certainly coming. The only question is, who will be blamed when it does? We all know it could not possibly have been the machinations of central banks, Western governments and entrenched financial firms that are responsible for global economic malaise. The Russians have already warned Turkey that they are willing to use tactical nukes to keep forces away from Damascus… so the Russians have nukes… Saudi Arabia has nukes… And many people believe Iran already has nuclear weapons. So we’re talking about a situation where we can potentially see nuclear war in the middle east, at least to a limited degree. What would that do to the global economy and financial system? This is a huge wildcard. Make no mistake, those who have orchestrated the fleecing of America, Europe and the rest of the world have absolutely no intention of admitting they are responsible for the disaster to come. As Future Money Trends suggests, a tactical nuclear war would be the perfect out for central banks and Keynesian economists. One way or the other, regardless of the catalyst, the system as we know it today and how we operate within it is about to change drastically. All over the United States, cities of refuge are being created. Now when I say “cities”, I don’t mean vast areas of land that can hold hundreds of thousands or millions of people. Rather, I am talking about much smaller places of refuge that can accommodate dozens or hundreds of people. In a few cases, I know of places of refuge that will be able to take in thousands of people, but that is about as big as they get. There are individuals all across America that have specifically felt called to build communities where large numbers of people will be able to gather when society totally collapses. So why is this happening? Why do so many people feel such an urgency to create cities of refuge that would presumably never be used if we don’t ever see full-blown societal breakdown? The assumption that bank deposits can be rapidly converted into cash does not hold up, in our opinion. If everybody wanted to take their cash out of the bank at the same time, the system would soon run out as there are simply not enough notes in circulation.It would take a considerable time to print the currency needed to meet the demand. A central bank could enforce a negative rate for a considerable period of time under these conditions. For example, in the US, even if the production rate is doubled – and assuming the pace of retirement of old notes is unchanged and there is demand for USD3trn of new notes – printing would take 20-years. To explain this, consider the demand for currency created if savers tried to remove cash from the US banking system. This demand could total anything between USD2.5trn (of excess reserves) and USD4.5trn (the Fed’s total balance sheet). Currently there is USD1.5trn of currency in circulation and the total annual production had a face value USD149bn in 2014, suggesting the 20 years it would take to print the cash. What a ban of Ben ($100 bill) would imply is that the total notional value of US currency in circulation would plunge from $1.35 trillion in themost recent week, to just $271 billion once the total $1.08 trillion value of $100 bills is eliminated. Putting this in context, there are as of this moment, $11.1 trillion in various forms of savings parked at banks as summarized in the chart below. 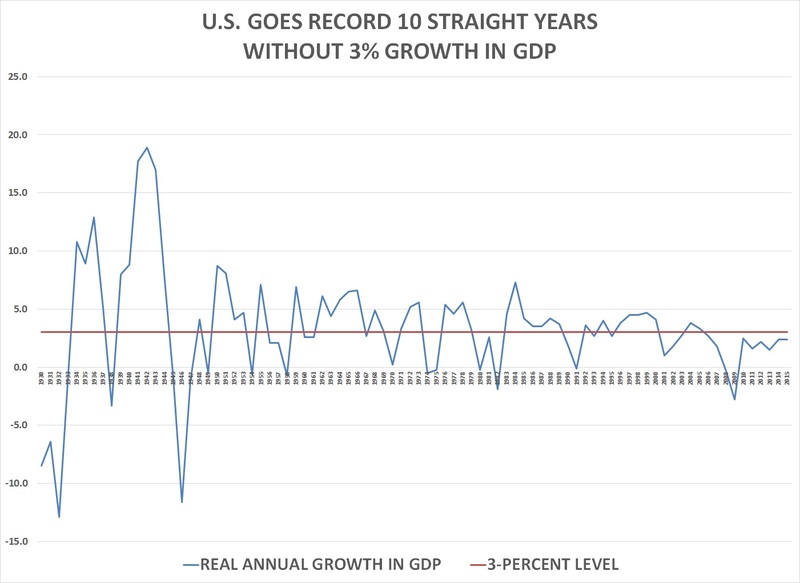 The United States has now gone a record 10 straight years without 3 percent growth in real Gross Domestic Product, according to data released by the Bureau of Economic Analysis. The BEA has calculated GDP for each year going back to 1929 and it has calculated the inflation-adjusted annual change in GDP (in constant 2009 dollars) from 1930 forward. The last recession ended in June 2009, according to the National Bureau of Economic Research. In the six full calendar years since then (2010-2015), real annual GDP growth has never exceeded the 2.5 percent it hit in 2010. The recovery since the global and European financial crises had put the price of gold under some pressure. The yellow metal, which some analysts view as a safe haven or as a protection against rising inflation, typically underperforms during periods when the economy is growing or inflation is low. However, in a note issued Friday, the German Bank said economic signs are pointing in gold’s favor. Barack Obama recently stated that anyone that is claiming that America’s economy is in decline is “peddling fiction“. Well, if the economy is in such great shape, why are major retailers shutting down hundreds of stores all over the country? Last month, I wrote about the “retail apocalypse” that is sweeping the nation, but since then it has gotten even worse. Closing stores has become the “hot new trend” in the retail world, and “space available” signs are going up in mall windows all over the United States. Barack Obama can continue huffing and puffing about how well the middle class is doing all he wants, but the truth is that the cold, hard numbers that retailers are reporting tell an entirely different story. Sears lost 580 million dollars in the fourth quarter of 2015 alone, and they are scheduled to close at least 50 more “unprofitable stores” by the end of this year. It is being reported that Sports Authority will file for bankruptcy in March. Some news reports have indicated that around 200 stores may close, but at this point it is not known how many of their 450 stores will be able to stay open. For decades, Kohl’s has been growing aggressively, but now it plans to shutter18 stores in 2016. Target has just finished closing 13 stores in the United States. The next seven examples come from one of my previous articles…Wal-Mart is closing 269 stores, including 154 inside the United States. K-Mart is closing down more than two dozen stores over the next several months. Macy’s has decided that it needs to shutter 36 stores and lay off approximately 2,500 employees. Aeropostale is in the process of closing 84 stores all across America. Finish Line has announced that 150 stores will be shutting down over the next few years.